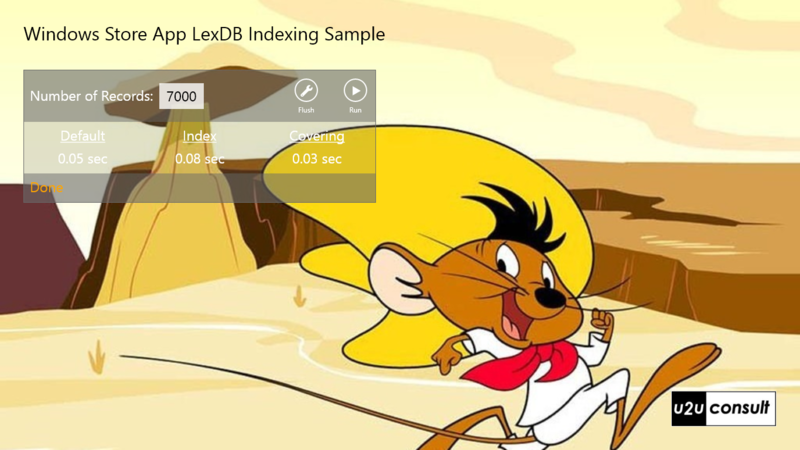 This article explains how to create fast queries against a LexDB database in a Windows 8 Store app, and how to keep these queries fast. LexDB is a lightweight, in-process object database engine. It is written in C# and can be used in .NET, Silverlight, Windows Phone, Windows Store, and Xamarin projects. For an introduction to using the engine in a Windows 8 Store app, I refer to a previous blog article of mine. When I migrated the database code from SQLite to LexDB I immediately noticed that SELECT statements in LexDB are pretty fast, but INSERT and DELETE statements are an order of magnitude slower, and run slower as the table size increases. That’s definitely something to consider, but as long as you stick to asynchronous calls, and as long as your app does not do any bulk operations, it’s nothing to really worry about. The performance of INSERT and DELETE statements surely had an impact on my sample app: the original app simply recreated the table when the target size was changed. With LexDB this isn’t an option anymore: the app now adds only the missing objects, or removes them. This allows you to gradually build up a large test table. So when you set a new size for the table, please use relatively small increments (depending on your hardware): you’d be amazed how long it takes to insert 1000 new objects into the table! Since LexDB is an object database, any query against the Person table will return a list of fully populated Person instances. There’s no way to do any projection to return only Id, Name, and Status. [Maybe there is a way, but I didn’t find it. After all, the official documentation is a short series of blog posts and the source code.] All query plans will eventually end up in the base table. 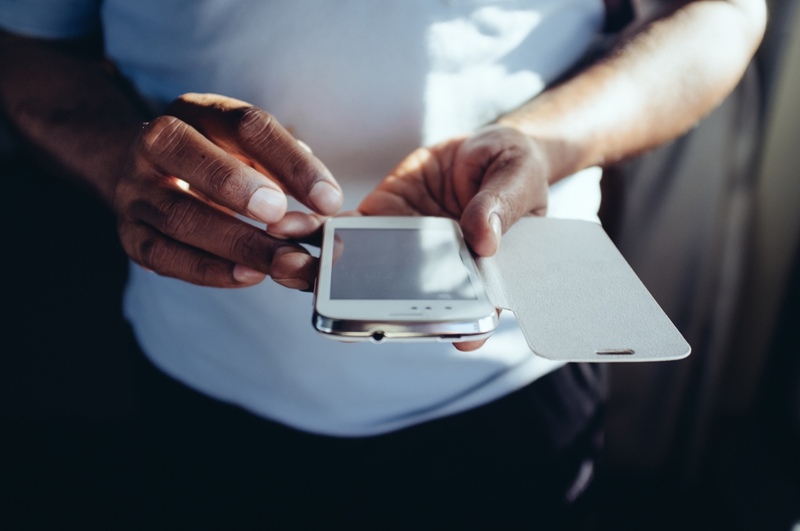 The IndexQueryByKey returns the primary keys of the requested objects (WHERE name=? ), and the query plan continues in the base table (file) to filter out the remaining objects (WHERE status=?). That’s why I didn’t notice any performance improvements: in most cases, the raw query ran even faster. So unless you’re looking for a very scarce value, a regular index on a LexDB table will NOT be very helpful. 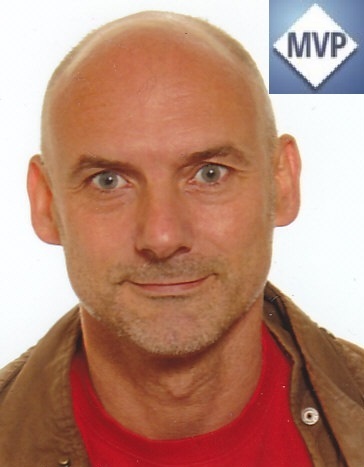 The same is true of course in SQL Server: indexes with a low density will be ignored. But in a relational database it’s the engine that decides whether or not to use an index, here the decision is up to you. As you see in the above app screenshots, the ‘covered’ query runs faster than the original query in all cases. But on the other hand: the difference is not that significant and will probably not be noticed by the end users. I can imagine that the real added value of these indexes will appear in more complex queries (e.g. when joining multiple tables). Let’s jump to the administrative part. The fragmentation caused by INSERT, UPDATE and DELETE statements has a bad influence on indexes: they get gradually slower over time. In most relational databases this is a relatively smooth process. It can be stopped by reorganizing or rebuilding the index. In LexDB this also happens, but the degradation is a less than smooth process. If you add and remove a couple of times a block of let’s say 1000 objects, then you’ll observe only subtle changes in the response time of the SELECT statements. Very suddenly the basic SELECT statement runs about ten times slower, while the indexed queries continue to do their job with the same response time. // Reorganizes the file (huge impact on performance). // For the sake of completeness. Compacting a fragmented table is a very rapid operation (less than a second) and it has an immediate result on the queries. 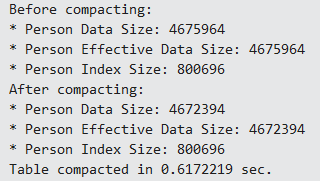 Compacting the data is something you may want to do on start-up, e.g. in an extended splash screen routine. Even though LexDB is not as advanced as SQLite, it comes with the necessary infrastructure to get some speed and maintain it.